WTI crude prices are above $52/b this morning for the first time in a month. Prices surged last night after the announcement of U.S. missile strikes on the Shayrat airfield in Syria, which President Trump stated was used as the base for Syrian chemical weapons attacks that killed more than eighty people. The markets had opened before this news was released, so opening prices do not reflect the volatility caused by the attacks. WTI opened at $50.80/b today, a drop of $0.38 below yesterday’s opening. 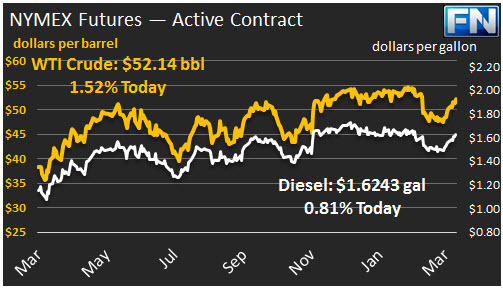 Current prices are $52.14/b, $0.44 above yesterday’s close. WTI prices spiked as high as $52.94/b last night, before receding this morning. Product prices also spiked, then declined and leveled this morning. Diesel opened at $1.596/gallon in today’s trading session. This was a decline of 0.22 cents (0.14%) below yesterday’s opening price. Current prices are $1.6243/gallon, up 1.14 cents from yesterday’s close. Gasoline opened at $1.7144/gallon today, a drop of 1.25 cents, or 0.72%, from yesterday’s opening. Prices are $1.7332/gallon currently, up 0.36 cents from yesterday’s close. Gasoline prices are at their highest levels since early August of 2015. 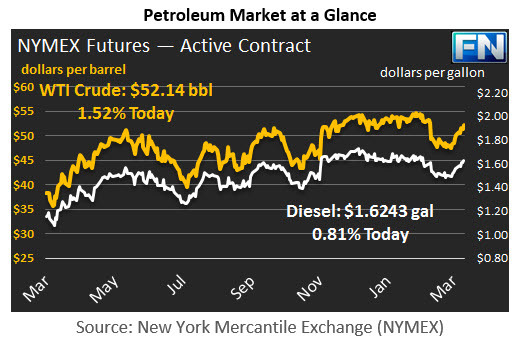 Before news of the U.S. attack caused prices to spike, oil prices had been on an upward trend. Prices were strong on Monday and Tuesday, stimulated by OPEC optimism and by industry forecasts predicting significant drawdowns in crude, gasoline and diesel stocks. However, prices sagged midweek when the EIA released the official data. The EIA reported an unexpected increase in crude oil inventories of 1.566 mmbbls during the week ended March 31st. Product stocks were drawn down less than anticipated: gasoline by 0.618 mmbbls, and diesel by 0.536 mmbbls. Per the API’s report, the market had anticipated a crude stock drawdown of 1.83 mmbbls, a gasoline stock draw of 2.6 mmbbls, and a diesel stock draw of 2.09 mmbbls. In net terms, therefore, the market had expected an inventory draw of 6.52 mmbbls total, whereas the official EIA data showed a net build of 0.412 mmbbls. The U.S. Bureau of Labor Statistics has just released its Employment Situation Summary for March 2017. The BLS reported that the U.S. unemployment rate dropped to 4.5% in March. This is the lowest unemployment rate since 2007, when rates were 4.5% in April and 4.4% in May. Economists may view the report as not entirely positive, however, because non-farm payroll employment “edged up by 98,000,” whereas the forecast had been for 180,000 jobs.